American Hooked Rug, c. 1900. Original design with great graphics! 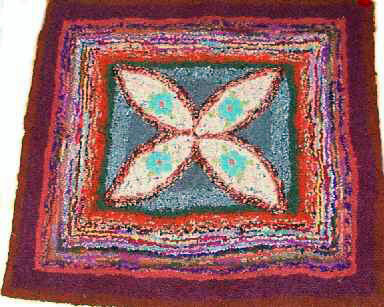 The borders create a shadowbox effect that draws the eye into the center of the rug. The rug is almost square ( 29" x 31") and is a great size for display. Worked in silk and wool on burlap, the condition is excellent and the colors are bright.